Okay, right off the bat, let me acknowledge that today's record is beat to hell, and that you'll have to listen past some righteously awful surface noise. But c'mon, it's Norm! 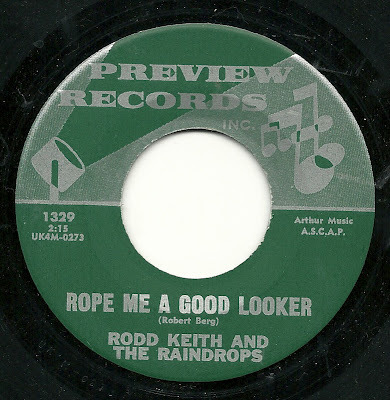 With a couple of winning tracks, ones I find quite worthy of suffering through the crackle and pop of an either over-loved or criminally mistreated and neglected 45. First up, "Red Hot Mama". 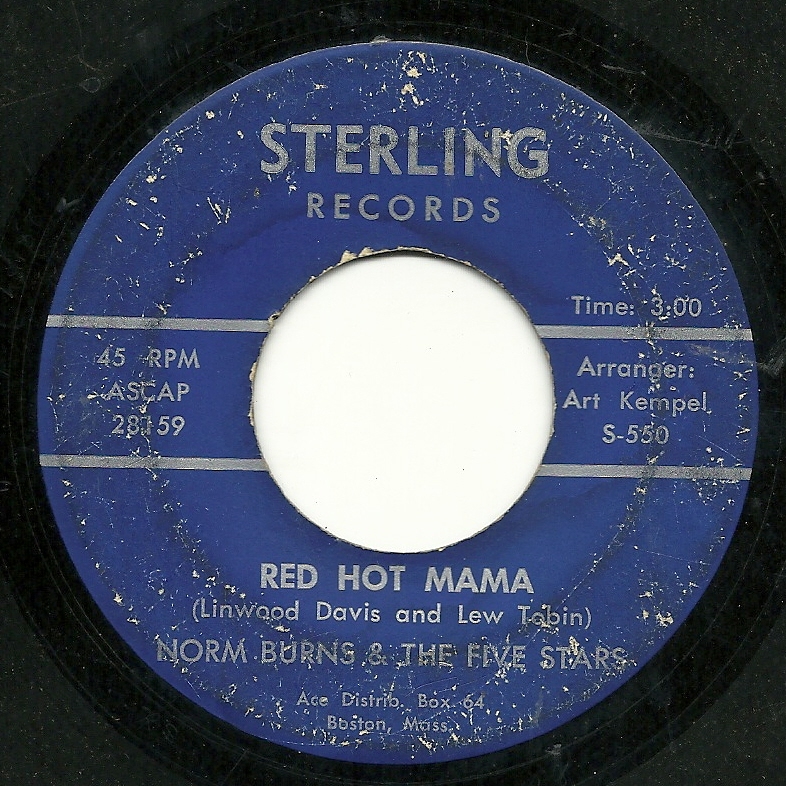 This one has slow, soulful beat, some really nice piano, and a typically wonderful vocal from Norm. 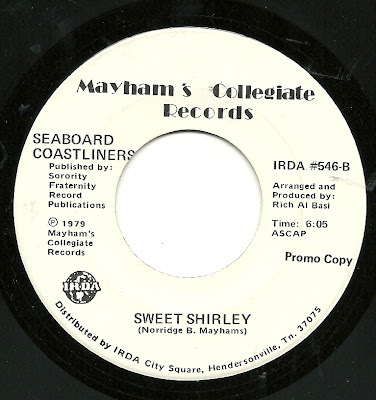 There's even an actual guitar solo, something I don't remember hearing on many Sterling records. 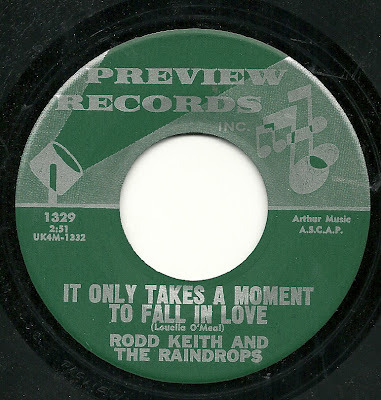 And another thing that makes this one unusual: I would also argue that this is the rare Sterling song-poem where the music reflects then-current (1971 or so) trends in music - elements of the backing track here reminds me of more than a few soul-pop records of the 1970-71 period. Stick around for the ridiculous repeating lyrics at the end of the record. On to side two, "Love Ya Honey". After a catchy, off-kilter instrumental introduction, we are treated to another superb vocal from Norm (who is probably one of my two favorite song-poem singers, along with Cara Stewart). Here, he makes magic with a really corny and repetitive lyric, and the arrangement also works wonders with what could have easily (in the hands of lesser companies by a stale performers) been rote and dull - I'm especially fond of the section from 1:50 to 2:05, where it sure sounds like there's been an extra beat or two thrown in, yet a careful counting shows that it never goes out of 4/4 time. 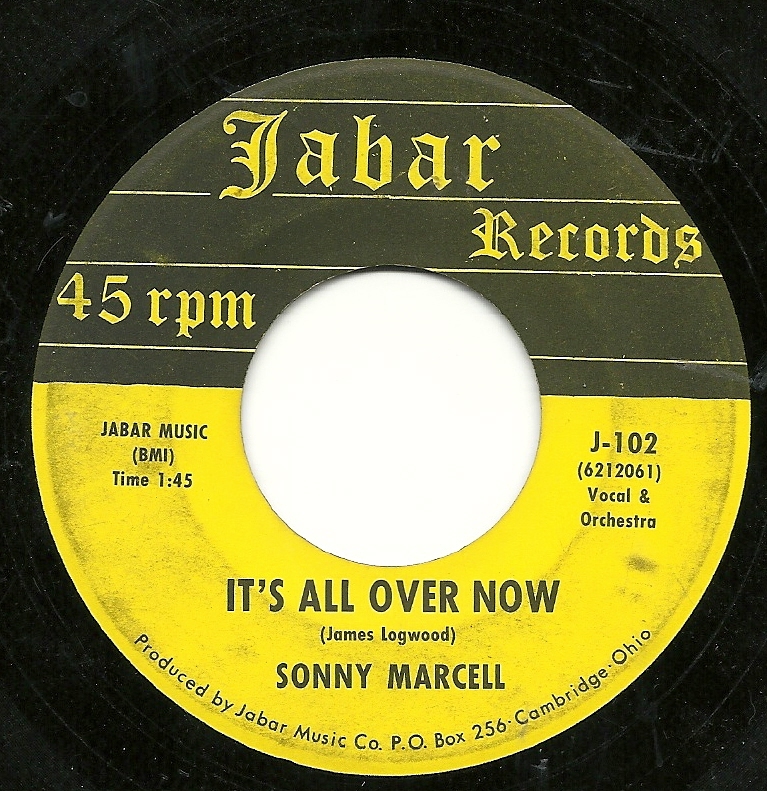 Ah, yes, "It's All Over Now". Is there a better record from the Stones' earliest period? Keith's guitar break - well, I guess you some love it and some hate it, but Charlie's drumming is propulsive and the whole band just cooks. And Sonny Marcell's lead vocal is.... wait, Sonny Marcell? One of the many names of song-poem Zelig Sammy Marshall? Are we talking about the same song? The same band? Er... I guess not. 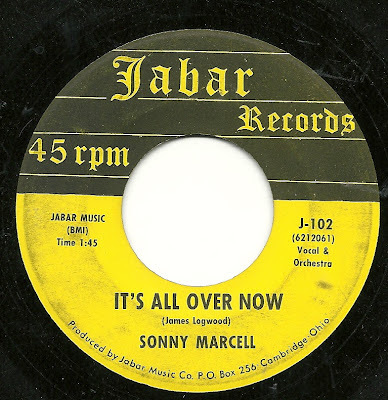 This "It's All Over Now" is another early '60's Globe factory special, in this case a performance that wouldn't sound out of place on the stage of a Holiday Inn lounge, released on the tiny Jabar imprint. Let's listen in! First, I want to mention that I recently wrote a post at WFMU's blog about a record which appears to have some song-poem connections, although it may or may not be a song-poem. It can be found here. And now, on with the countdown! How do YOU spell the words that make up the first line of a classic children's rhyme, the ones which come before "catch a tiger by the toe"? 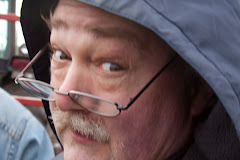 A quick web search finds only a few minor disagreements - Virtually everyone agrees on a combination of some of the following "Eeny/Eenie, Meeny/Meenie, Miny/Miney/Minie, Mo/Moe". 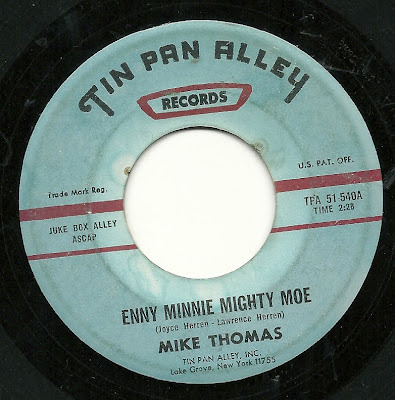 For Joyce and Lawrence Herren, however (and virtually no one else in the world, as far as Yahoo and Google appear to be concerned), the phrase is spelled﻿ "Enny Minnie Mighty Moe". Fascinatingly, at one point Joyce recorded the song herself, and it has shown up on at least one compilation, and in a posting on youtube. The song isn't much, but that's a winning performance in my book. 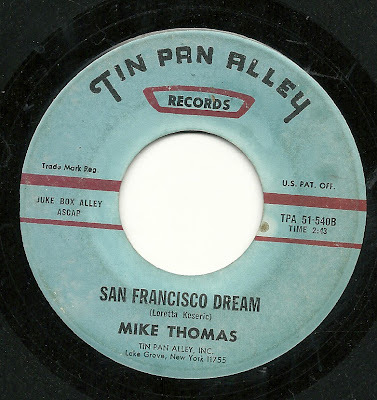 For some reason, the authors then handed off their composition to Mike Thomas, of Tin Pan Alley, who recorded it with the same collection of Garage Rock wannabes that show up on many of his records. The results were as predictable as every other TPA record of the era - minimalist backing and a lightweight vocal from Mike, which gives way to a barely competent (or perhaps you favor the phrase "borderline incompetent" garage style solo section. On the flip side, we have a tragic story. It's of a young person who seemingly threw away everything in life, and took a plane to San Francisco, on the hopes on connecting with the sweetheart who lived there. As you'll hear, if you can stomach the rather tuneless song that long (and get through lines like "I dreamed that waiting at airport"), it didn't quite work out as planned. Stick around after he tells his story for more Guitar God in training moments. Within the greater song-poem world, Norridge Mayhams has always been something of a hero to me. Not only did he do it all himself, he often did it quite well. In a career lasting over 40 years, he went from Gospel to Raunchy Blues, from Latin-tinged idiosyncratic records to straight ahead pop and rock and roll. 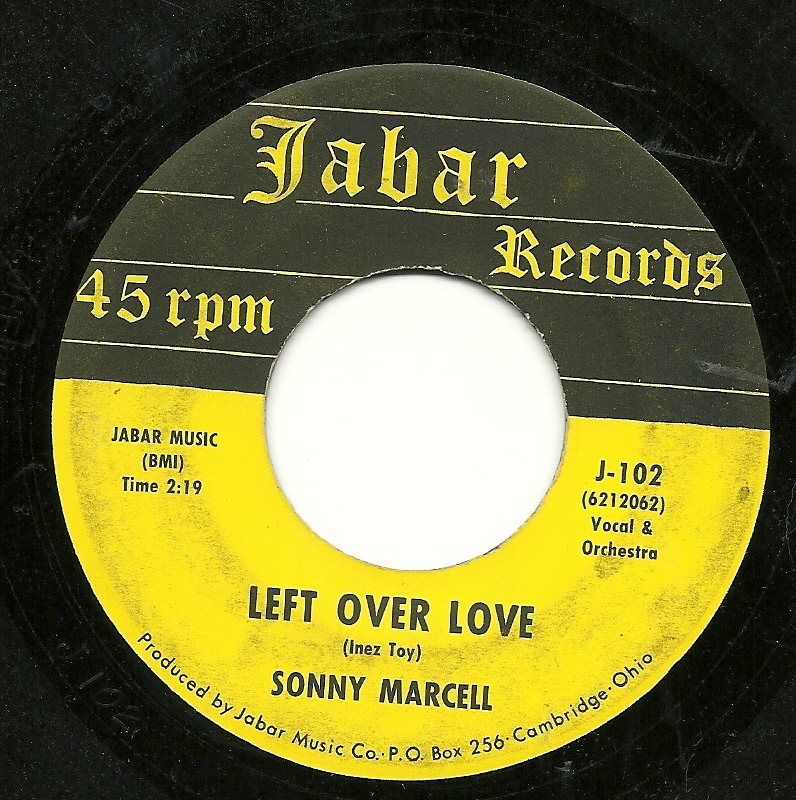 He wrote both the words and music for most of his songs, and in the early days (through at least the late '50's) even sang on several of his records, in addition to releasing them on at least three of his own record labels. He even wrote a hit song, "We'll Build a Bungalow". One of his records, the earlier of at least two versions of his song "Mary Ann McCarthy", remains one of my three or four favorite song-poem records. So it was with considerable sadness that I listened for the first time to today's record, which is among the last that Mayhams produced. As described at the AS/PMA site linked above, shortly after his final triumph, the 1976 double album capturing a good 15 years worth of his best material, Mayham's life began to fall apart. As heard here, just three years later (in 1979), not only has he moved on from some truly wonderful styles of music, and into the most mindless version of disco possible, but he is also expressing his grief at the death of his dear wife, Shirley. The words are actually touchingly sweet, but when paired with the stupid beat, the obnoxious synth, the out of town guitar and single trumpet notes (not to mention the crappy production), the effect is fairly depressing. My guess is that it is Norridge Mayhams himself singing here. If so, it's with (in what was probably his 70's) a shadow of the life-affirming voice from his records of two and three decades earlier. 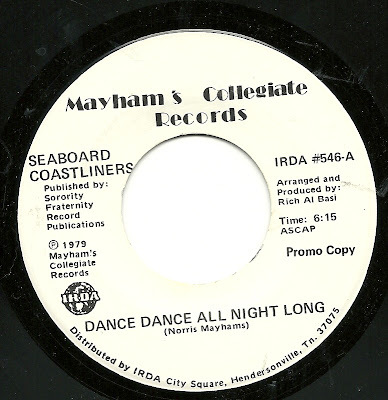 By the way, at least one further Mayhams record may have been released, if the order suggested at AS/PMA is accurate, that one featuring what may be this same recording of "Dance Dance" along with a disco remake of "We'll Build a Bungalow"